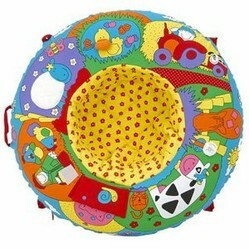 A baby playnest is designed for both babies and toddlers, and is a circular inflatable ring. This provides a self-contained environment in which babies can play and explore. The child sits in the center of the ring, which is quilted and is comfortable for the baby to sit. The ring itself varies in sounds, textures and patterns, giving the baby stimulation during play, and support while resting. It is recommended for use for babies above the age of six months. Cleaning is easy, as the entire cover can be washed in a washing machine. The playnest is produced by the company Galt and there are several variations. In addition to providing stimulation for babies, the playnest helps to strengthen the core muscles associated with sitting. Even when babies are old enough to crawl out from the playnest, it is a good place for them to relax and calm down, in addition to the educational benefits that it provides. One of the benefits of the nest is that it has a wide range of uses as the child ages. When the baby is young and cannot sit up, the playnest provides a place of security where the child can rest against the raised edges. As they begin to sit up, the nest provides a measure of security; because if they fall backwards, then they land on a soft surface. Because the playnest can be deflated, it is easy to transport, and takes up little space when travelling. It can be inflated using a hand pump, or by mouth. Fully inflated, the playnest is lightweight, and can easily be moved from one location to the next. Storage is also easy, either the playnest can be deflated and stored that way, or it can be hung up off a handle. The basic Galt playnest comes in two variations, farm and jungle. The farm variation has images of 12 different animals and five different textures. A more complex variation also exists which is the Playnest and Gym. This consists of the same basic playnest design, but in addition, there are two intersecting arches, which toys hang off. This provides stimulation for children who have progressed to the stage where they can sit with little effort, and they are beginning to look for new stimulation. The addition of the gym portion to the playnest allows it to be useful for much longer in an infant’s life. 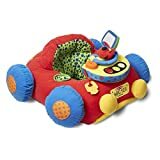 A different Galt product which follows a similar idea is that of the playnest car. Like the standard playnest, this is inflated on all sides. However this is aimed more at older infants who are able to sit up. The design of the product is similar to that of a car, and like the standard playnest, it is fully machine washable. One of the key features of the product is the motoring sounds and the interactive dashboard. 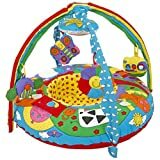 A similar product is the Bright Starts Prop and Play Mat. This has many of the same interactive features and supports both sitting up and lying down. However, it does not have the same measure of independence that the playnest has. 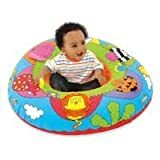 In the playnest, the baby is surrounded by a cushioned surface, so they cannot fall and hit their head- this is not true of the Bright Starts Mat. kinworm, thank you for your comment! My daughter had a baby play nest - it made a soft and safe environment for her.